The girls found what they thought was a baby mouse on the floor the other day. We captured it in a cup and it turned out to be a shrew, specifically the Masked Shrew (Sorex cinereus). Because of the cool wet spring we've had, the garden went in late. Here the girls are planting corn, beans, and peas. All our vegetables are short-season heirloom varieties geared for northern climates. Typical tableau at our house: eggs in a basket, and tankards ready to ship. ...with the help of another boy who volunteered to step on it and get sprayed. My mom sent over a huge bouquet of lilacs. 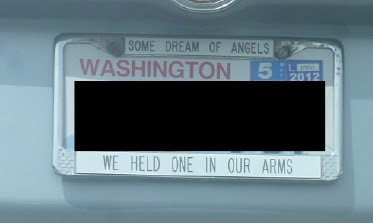 An achingly sad license plate frame. Ten words tell the story. ...and this one, having done her duty, is just hangin' around. wow! nice to know that kids (somewhere) still work out in the garden and play dress up games!! thanks so much for the picture stories!! awesome! Nice pictures. I like the bumper sticker.